Home Apple iPhone Why is the Battery Yellow on My iPhone 6? Yellow battery icons are becoming a lot more prevalent on various iPhone models. This occurred with the update from iOS 8 to iOS 9. 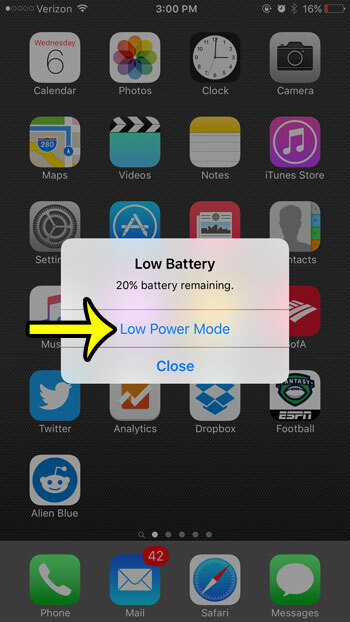 The iOS 9 update brought some interesting new features to the iPhone, including one called Low Power Mode. This is an option on the Battery menu that will adjust some of the more power-hungry settings on your device, which will allow you to get more time out of your battery. Tap the button to the right of Low Power Mode to turn it on. 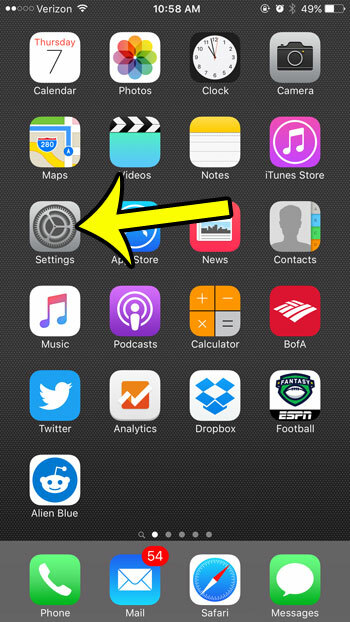 Step 1: Open the iPhone Settings menu. Step 2: Tap the Battery option. Step 3: Tap the button to the right of Low Power Mode to turn it on. 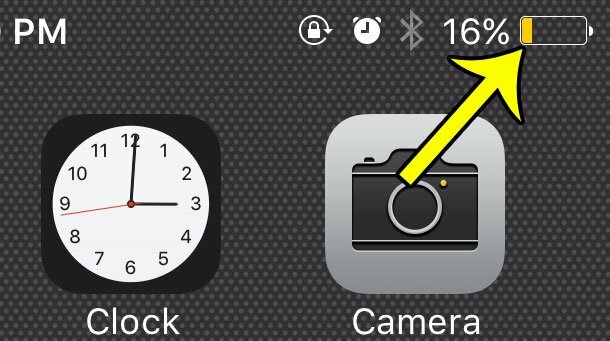 Question 1 – Why is the iPhone battery icon yellow? Answer 1 – The battery icon on the iPhone becomes yellow when your device is in Low Power Mode. 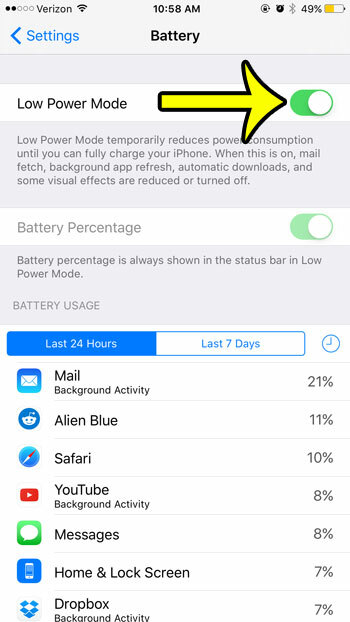 Question 2 – How did my iPhone get in Low Power Mode? 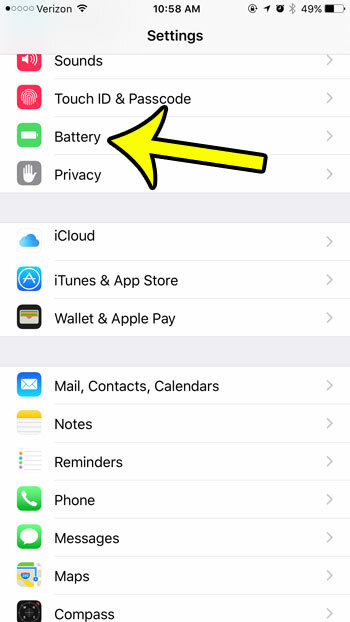 Answer 2 – Your iPhone can end up in Low Power Mode because you manually enabled it by going to the Settings > Battery menu, or it can be activated by a prompt that appears on the device when your iPhone’s battery percentage gets to 20% or less. Question 3 – What is Low Power Mode on the iPhone? Answer 3 – It’s a mode on the device that changes some settings in an effort to prioritize extending the battery life as opposed to keeping your phone operating with all of its default, battery-draining settings. Question 4 – What settings are affected when my iPhone goes into Low Power Mode? Question 5 – How do I exit Low Power Mode? Answer 5 – You can exit Low Power Mode by going to the Settings > Battery menu and turning off the Low Power Mode setting. Additionally your iPhone will also exit Low Power Mode when it has been recharged above 80%. Question 6 – Can I use Low Power Mode all the time if I don’t mind the reduced functionality, and enjoy the extended battery life that it provides? Answer 6 – Yes, you can turn Low Power Mode on or off at any time. However, the iPhone will always turn it off when the phone is charging and goes above 80%. 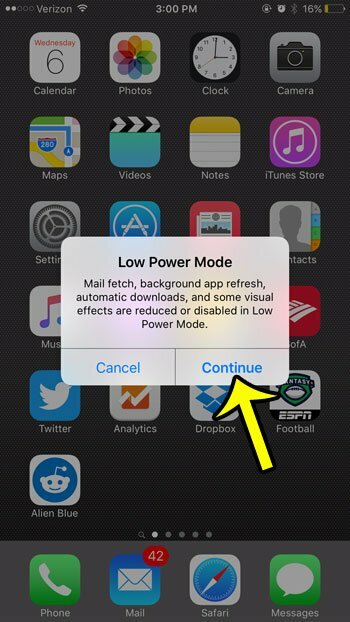 Question 7 – When did Low Power Mode become an option on my iPhone? It hasn’t always been there, and I know that I didn’t notice it on my old iPhone, or on older versions of iOS. Answer 7 – The Low Power Mode feature was introduced in iOS 8, and has been included in each version of iOS released since then. Low Power Mode is enabled. You can enable Low Power mode via a pop-up that appears when you have less than 20% battery life. Low Power Mode will stay on unless you turn it off, or until your battery is charged to greater than 80%. Low Power Mode and the yellow battery indicator will remain active until you either turn it off manually, or the iPhone is charged to 80%. Once the iPhone has charged above 80%, it will automatically switch from a yellow icon to green, white, or black, depending upon whether the phone is charging, and the color of the background. You will note that Low Power Mode will cause your remaining battery life to display as a percentage. You can read here to learn how to enable or disable the battery percentage from being displayed outside of Low Power Mode.